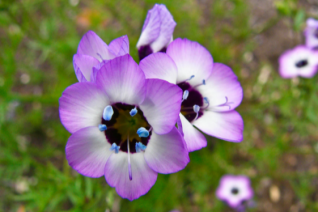 Globe Gilia or Bluefields is a widespread wildflower from British Columbia to Baja. To 20″ tall and forming a substantial plant very quickly. From April to July and sometimes longer these striking sky blue flowers appear and rise on tall stems displaying the orbs of flowers. If you apply light consistent water and remove the spent flowers they can re-bloom. Otherwise, they persist until hot weather and then set seed and die. Studies at OSU on native pollinators ranked this #1 as their source for pollen/nectar. That alone gives you reason to include this re-seeding plant in your garden. Rich, to average disturbed sites are ideal. It often grows and self sows in the disturbed slopes of road cuts, dry hillsides. 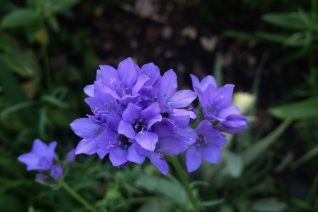 In the garden it LOVES good conditions and will be much larger, bloom longer, with flowers of a darker hue of blue. A great wildflower for the garden that makes a sweet cut flower. Loved by pollinators of all kinds. Wild areas, hell strips, dry gardens. Easy to naturalize if you contain the competition from other plants. Locally native in the Portland city limits. New plants germinate in autumn and overwinter happily. Oregon native plant. Yarrow Gilly Flower as the 49ers named this sweet little annual California wildflower. 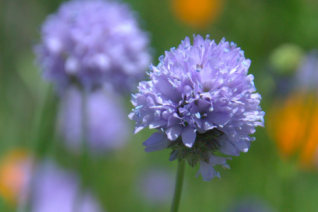 Frilly green foliage gives rise to 10″ stems supporting violet to sky blue flowers. Blooms May-July in our climate. Very easy to naturalize in open disturbed sites. A great reblooming pollinator wild flower. Makes sweet little bouquets as well. Full sun and lose un compacted soil- turn the soil to incorporate oxygen before planting. Light summer water keeps things going. Or it will finish with drought setting seed for the next years performance. Bird’s Eye Gilia is a showy and delicate appearing but tough hardy annual from the central valley of California into the Coast Ranges as well as Sierra Nevada foothills. To 6″ tall each stalk bears multiple gorgeous purple to white flowers with a distinct dark eye. Give your pollinators a treat this diminutive plant will bloom for 4-6 weeks in late spring to summer in our climate. Give it open disturbed soil without competition form invasive grasses to complete its life cycle, where it will reseed with abandon. Lovely little west coast native annual for sunny, wild sites. Good in containers for a brief but brilliant wildflower display. Excellent in parking strips where it will love the reflected heat. Light consistent water until its time to go quietly to sleep. Good drainage helps.